Jono needs three things in a hurry: 1- a handkerchief, 2 - a friend, 2 - an amazing silvery dream machine of a scooter like Belinda the Biff's. But first he has to go to the dentist's. 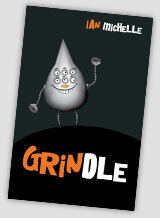 There, to him great surprise, he meets Grindle. Is he an alien? Is he a dream? No - he's a Ligh... read full description below.